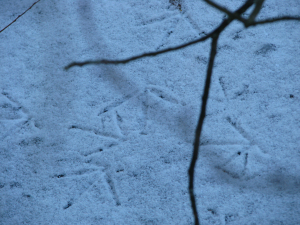 Observation - Foot prints of moorhen on snow covered ice at Paxton Pits - UK and Ireland. Description: Long thin toe prints on the edge of Cloudy Pit. There were lots of these as if the bird was hiding under the reeds for shelter. Long thin toe prints on the edge of Cloudy Pit. There were lots of these as if the bird was hiding under the reeds for shelter.